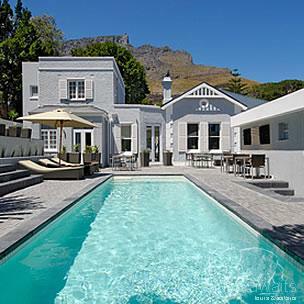 2inn1 Kensington is a stylishly renovated Boutique Guest House situated in the quiet and prestigious suburb of Oranjezicht, Cape Town. Flanked by the imposing slopes of Table Mountain and Lion’s Head and overlooking Leeuwenhof Estate the wooded parkland residence of the Premier of the Western Cape, 2inn1 Kensington combines an authentically, stylishly remodeled Victorian house and a modern designed bungalow. Inside the rooms, an individual luxury style with modern African spirit will welcome you. At the heart of 2inn1 Kensington are its tranquil garden, sun bathed pool area and sheltered terraces affording panoramic views of the surroundings. Indulge in cosy breakfasts, snacks at the poolside and complimentary sundowners and allow yourself to be graciously hosted by the dedicated team at 2inn1 Kensington. 2inn1 Kensington is within walking distance of the vibrant Kloof Street coffee shops, bars and restaurants and very close to all of Cape Town’s main attractions such as Waterfront, Table Mountain, Lion’s Head, Signal Hill, beaches and city center. This fusion of nature and city living will give our guests a true sense of what Cape Town is about. Comfortable, luxurious and individually styled en suite rooms with a modern African spirit await you in the main house and across the terrace you will find a further en suite luxury bedrooms as well as a spacious deluxe suite (sleeps 4) in the bungalow. The rooms are equipped with every possible comfort. Most of the rooms offer balconies or private terraces. 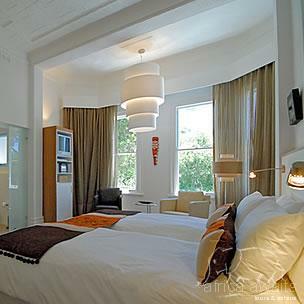 With your holiday, safari or business trip from in to 2 inn 1 Kensington in Cape Town.